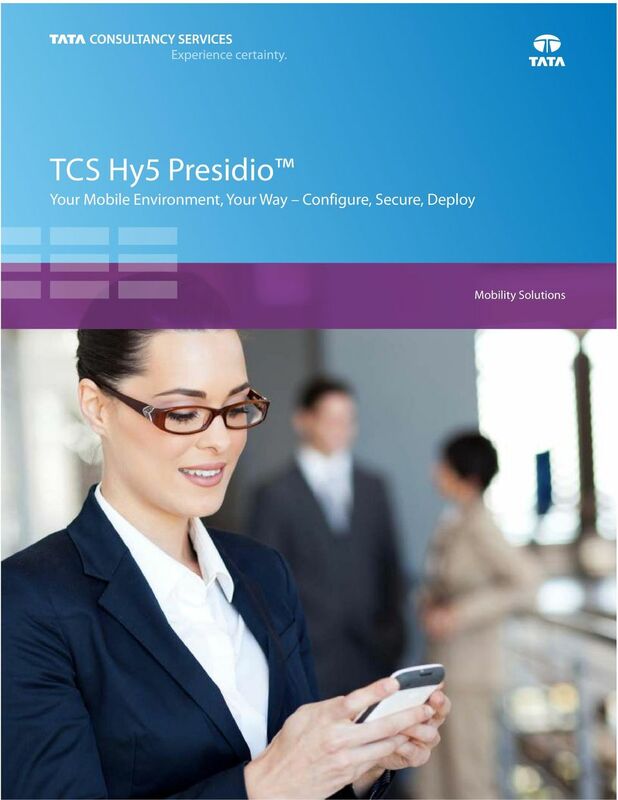 Download "TCS Hy5 Presidio Your Mobile Environment, Your Way Configure, Secure, Deploy. Mobility Solutions"
2 The growth of in-house and third-party enterprise mobile applications; device diversity across ios, Android, Windows Phone, Blackberry and other platforms; and the increasing volume of both corporate-issued and employee-owned devices have resulted in a complex enterprise mobile ecosystem. This creates numerous challenges for enterprise IT, which include accommodating employee-selected devices and applications, securing networks and data, deploying applications, and efficiently configuring and monitoring devices. 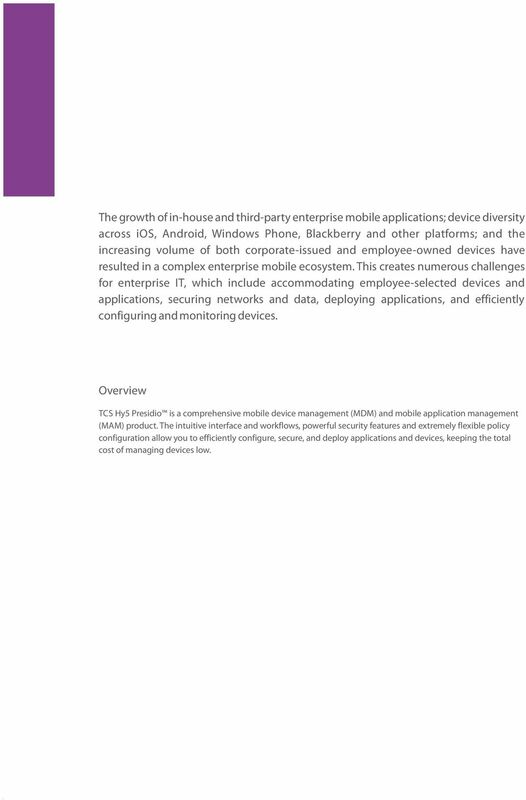 Overview TCS Hy5 Presidio is a comprehensive mobile device management (MDM) and mobile application management (MAM) product. 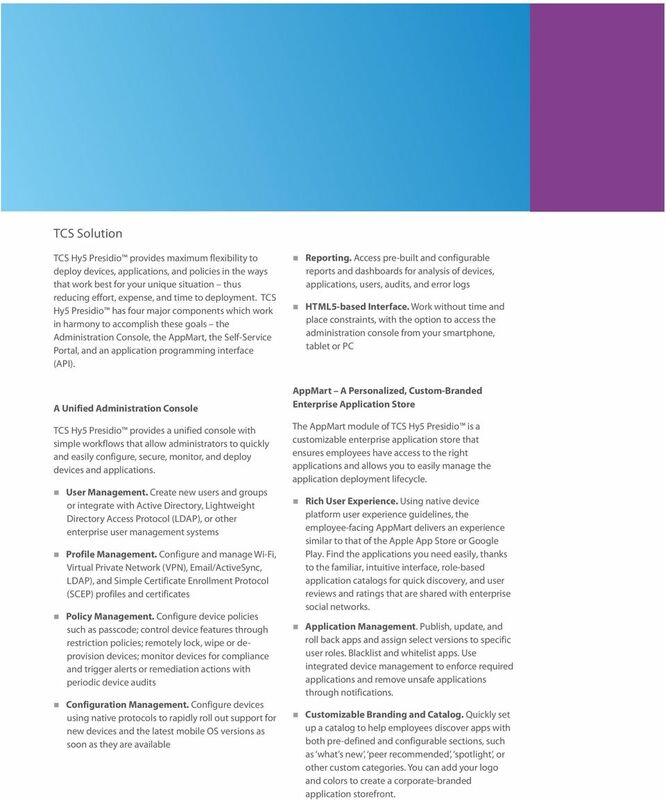 The intuitive interface and workflows, powerful security features and extremely flexible policy configuration allow you to efficiently configure, secure, and deploy applications and devices, keeping the total cost of managing devices low. 3 TCS Solution TCS Hy5 Presidio provides maximum flexibility to deploy devices, applications, and policies in the ways that work best for your unique situation thus reducing effort, expense, and time to deployment. TCS Hy5 Presidio has four major components which work in harmony to accomplish these goals the Administration Console, the AppMart, the Self-Service Portal, and an application programming interface (API). Reporting. Access pre-built and configurable reports and dashboards for analysis of devices, applications, users, audits, and error logs HTML5-based Interface. Work without time and place constraints, with the option to access the administration console from your smartphone, tablet or PC A Unified Administration Console TCS Hy5 Presidio provides a unified console with simple workflows that allow administrators to quickly and easily configure, secure, monitor, and deploy devices and applications. User Management. Create new users and groups or integrate with Active Directory, Lightweight Directory Access Protocol (LDAP), or other enterprise user management systems Profile Management. Configure and manage Wi-Fi, Virtual Private Network (VPN), /ActiveSync, LDAP), and Simple Certificate Enrollment Protocol (SCEP) profiles and certificates Policy Management. Configure device policies such as passcode; control device features through restriction policies; remotely lock, wipe or deprovision devices; monitor devices for compliance and trigger alerts or remediation actions with periodic device audits Configuration Management. Configure devices using native protocols to rapidly roll out support for new devices and the latest mobile OS versions as soon as they are available AppMart A Personalized, Custom-Branded Enterprise Application Store The AppMart module of TCS Hy5 Presidio is a customizable enterprise application store that ensures employees have access to the right applications and allows you to easily manage the application deployment lifecycle. Rich User Experience. Using native device platform user experience guidelines, the employee-facing AppMart delivers an experience similar to that of the Apple App Store or Google Play. Find the applications you need easily, thanks to the familiar, intuitive interface, role-based application catalogs for quick discovery, and user reviews and ratings that are shared with enterprise social networks. Application Management. Publish, update, and roll back apps and assign select versions to specific user roles. Blacklist and whitelist apps. Use integrated device management to enforce required applications and remove unsafe applications through notifications. Customizable Branding and Catalog. Quickly set up a catalog to help employees discover apps with both pre-defined and configurable sections, such as what s new, peer recommended, spotlight, or other custom categories. You can add your logo and colors to create a corporate-branded application storefront. 4 Multiple Distribution Scenarios. You can link to the App Store or Google Play right from the AppMart thus addressing the need to combine distribution of in-house and external applications in a single interface. Integration with the Apple Volume Purchase Program (VPP) also enables distribution of external applications to employees, partners, suppliers, and contractors in a controlled fashion. The Self-Service Portal: Empowering Employees in the Mobile Enterprise The web-based Self-Service Portal allows end users to enroll their own devices, install the AppMart, report a lost device, lock or locate a device, and execute a selective or full device wipe. The portal fully supports LDAP and Active Directory, Simple Certificate Enrollment Protocol (SCEP) enrollment, and enterprise workspace setup for Android. An API for Flexible Integration and Deployment When you only require device management functionality for specific applications, such as a field service or mobile sales force application, the ability to provide disaggregated mobile device management is invaluable. The TCS Hy5 Presidio API lets you embed device management functionality into the app, giving you features such as device locking and wiping without the overhead of a full-blown MDM solution. The API also enables you to integrate with IT help desk or HR management systems to support end-to-end business processes that fulfill employees mobility needs. 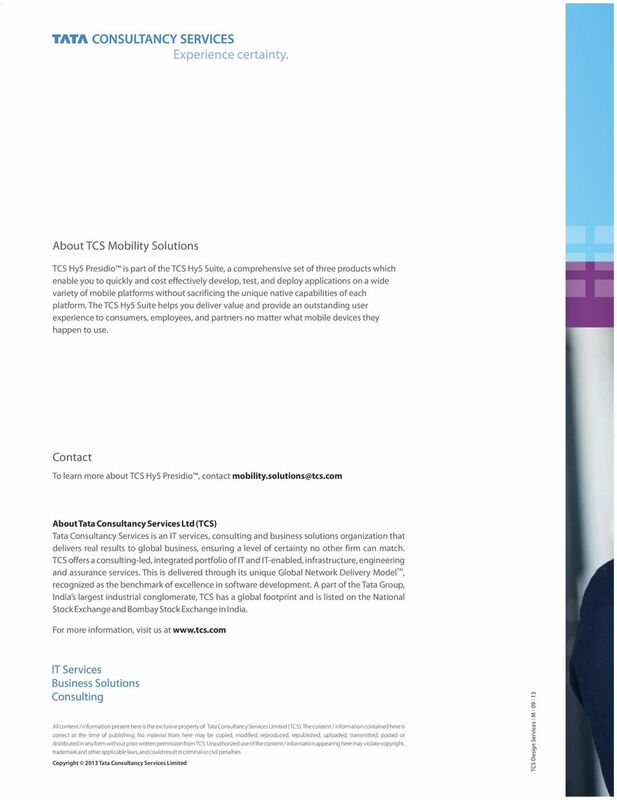 The TCS Hy5 Suite Develop, Test, and Deploy with the Complete Enterprise Mobility Suite The mobile world is rapidly evolving. New devices, features, and operating systems are constantly introduced and subsequently adopted by consumers and application developers alike. 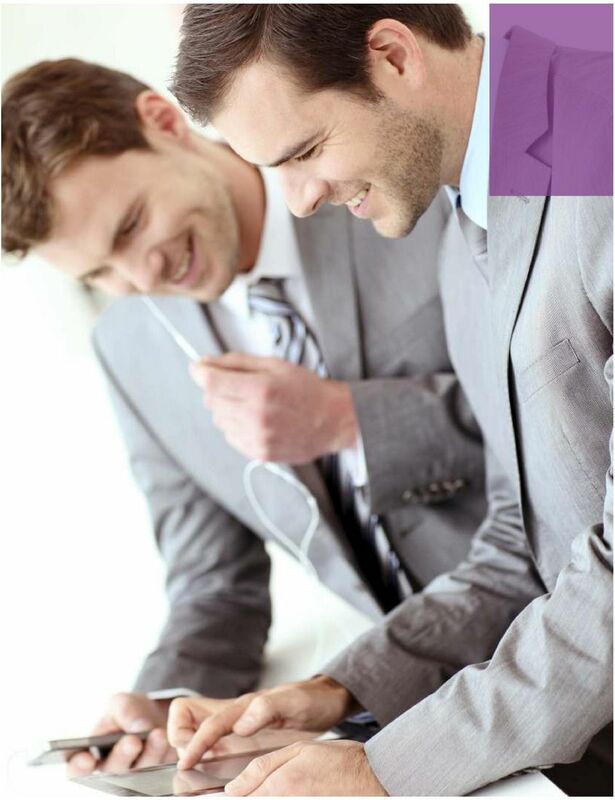 For long-term success in your mobility strategy, you need the flexibility to rapidly adapt. TCS Hy5 Presidio is part of the TCS Hy5 Suite, a comprehensive set of three products which enable you to quickly and cost effectively develop, test, and deploy applications on a wide variety of mobile platforms without sacrificing the unique native capabilities of each platform. The TCS Hy5 Suite helps you deliver value and provide an outstanding user experience to consumers, employees, and partners no matter what mobile devices they happen to use. TCS Hy5 Canvas is a true end-to-end development platform for creating hybrid mobile applications. 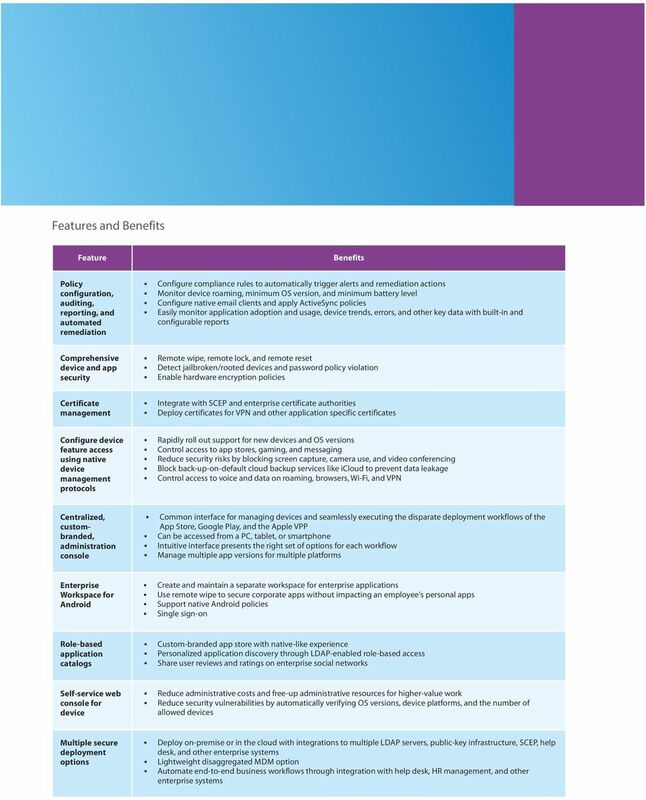 It consists of a full-featured, drag-and-drop, integrated development environment; native wrappers to give applications a native look and feel while accessing powerful device features like GPS or the camera; client run-time components to help optimize performance; and powerful middleware connectors to seamlessly integrate with the workflows and data that run your business. 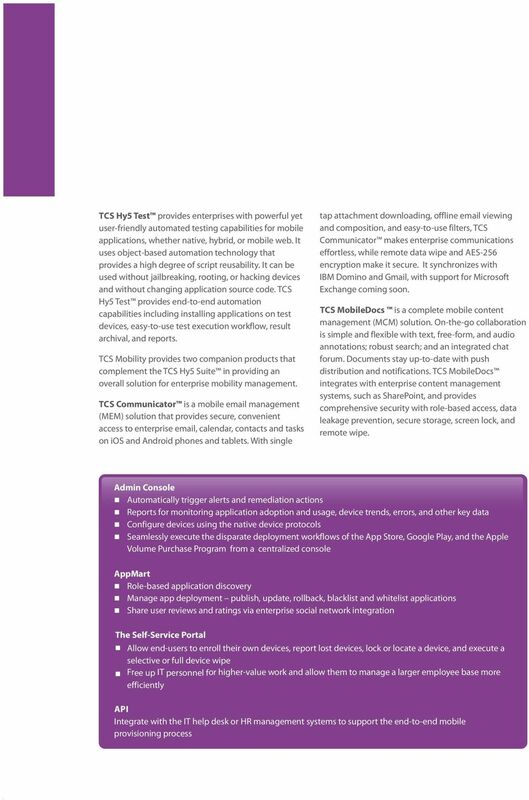 With standard connectors to SAP, Oracle, and other enterprise platforms, as well as support for Android, ios, Windows Phone, and BlackBerry, TCS Hy5 Canvas quickly and easily enables your mobile application development initiatives. White Paper Conferencing Agent Enhancing the Communication Experience To achieve corporate operational excellence, the existing resources of an organization must be utilized to the best possible extent.